Mammootty’s Telugu film Yatra is all set to hit screens this Friday (February 😎. As per reports, the movie will be released in three languages – Telugu, Malayalam and Tamil – simultaneously. The trailer of the Malayalam version was released by Kannada superstar Yash today in an event held at Kochi. 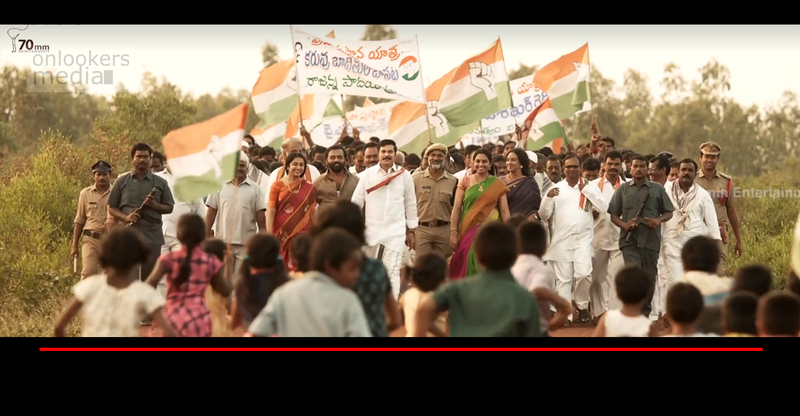 ‘Yatra’, written and directed by Mahi V Raghav is based on the late Andhra Pradeesh Chief Minister YS Rajasekhar Reddy aka YSR. The movie is based on the historical three-month-long padayatra that YSR took in 2003, which became a changing point in his political career. Mammootty plays YSR in the movie. The cast comprises of Rao Ramesh, Anasuya Bharadwaj, Suhasini Mani Ratnam, Posani Krishna Murali, Vinod Kumar and Sachin Khedekar. Vijay Chilla and Shashi Devi Reddy are jointly producing Yatra under the banner of 70MM Entertainments. The USA premiere is scheduled on February 7. The movie is getting ready as the biggest ever release in Mammootty’s career. Kerala distribution rights of the Malayalam version has been bagged by Global United Media, who have earlier released blockbuster films like ‘Baahubali’, ‘KGF’, ‘The Jungle Book’ and ‘Mersal’.